Are you planning your next family vacation? Perhaps, you’re considering a beach holiday to Spain? Or, a camping holiday to Scotland? What about a safari in South Luangwa? Going on a safari with kids is a life-changing experience and a hugely educational one. Children and their parents can learn a lot from a few days in the bush. Consider the open plains of the bush a classroom, an enormous outdoor classroom. The educational benefits of an African safari are almost endless and sometimes serve to directly reinforce concepts connected to the school curriculum. In Africa, children learn important lessons about history, geography, and biology without even realising they are doing so. An African safari has the power to instil in young children an appreciation of the natural world which they may not get at home. Children can experience the African bush first-hand by joining guides on bush walks. Where they will learn about spoor identification and tracking on foot. Furthermore, kids can hold creatures such as lizards, insects, snakes and scorpions and examine them closely with an expert – a trained guide. The learning doesn’t stop with the wildlife. Zambia’s culture is interesting and likely different to most visiting families. Interaction with the local community can teach children invaluable lessons about the way in which other people live. A visit to a local school can often be arranged. Through such an interaction with people of a similar age, children gain an appreciation of the richness of other cultures, as well as empathy for the issues that affect those less privileged than themselves. One of the most important lessons a child will learn when visiting Zambia is the importance of caring for the wildlife and the environment. Seeing animals in the wild which are directly impacted by modern-day challenges and being educated on the conservation efforts of the park will inform how that child views the environment and shape the role they will play in preserving it for future generations. In the introduction, we highlighted a few points which may put some parents off booking a safari, including long game drives and journeys. To overcome long game drives, don’t go on game drives every day. A day in camp can be extremely insightful and entertaining. Aside, from the educational points, kids can enjoy thrilling close encounters with Vervet monkeys and monitor lizards. The typical game drive is 4 hours long and this happens twice a day. Depending on where you stay, you can decide to go on a shorter game drive. Doing so will help keep your child’s attention span. As let’s be honest, after 4-hours many adult’s attention will begin to wonder. To keep kids entertained on drives don’t emphasise the big 5 (4 of which can be seen in South Luangwa), get excited about whatever ignites your child’s interest – whether it’s an oxpecker in an impala’s ear or a grunting pod of hippo. Some more exclusive camps maintain a lower age-limit of 12 but most camps do not have such restrictions. 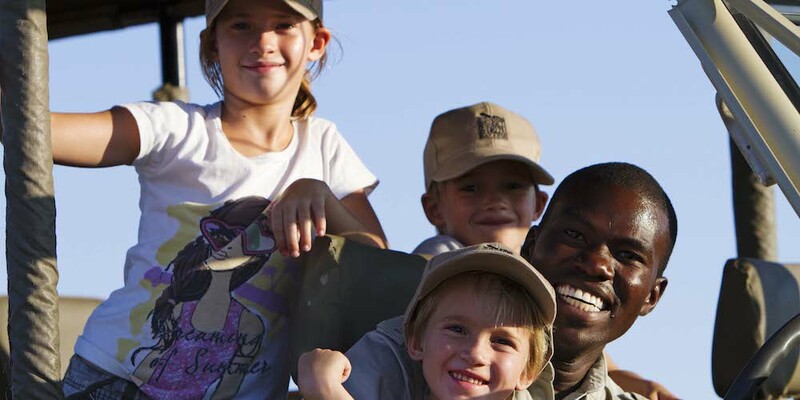 We believe children aged eight and up will gain the most from a safari trip. As by this age, the children can engage with the guide or someone from a local village, whereas younger children may not value the interactions quite as much. 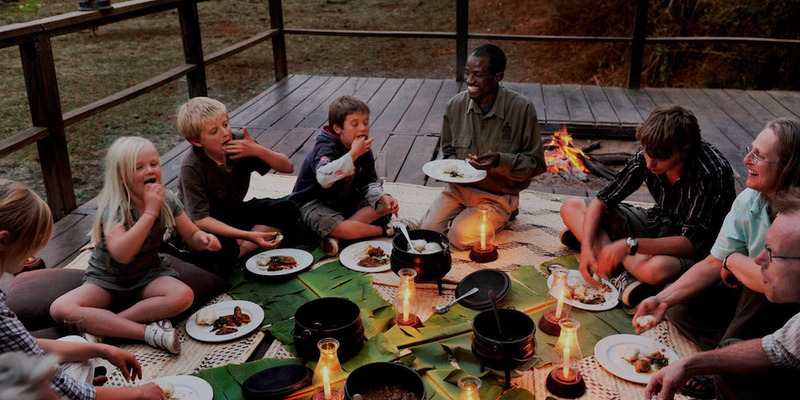 In South Luangwa, there are lodges designed especially for families. You can view them, here. If your budget doesn’t stretch to a ‘house’, make sure the camp has a pool as that’s always a great place to exert some energy! A holiday isn’t just about the kids, it’s important for parents to get some time to themselves, away from the distractions of daily life, such as work, cooking, cleaning and staring at a screen. A safari holiday allows you to get away from all that. Wi-Fi in the bush tends to be poor, so, you won’t be tempted to check emails or scroll through social media. You can just be in the moment and live it. If you want time away from the kids; care can be arranged and the two of you can enjoy a romantic dinner, allowing you to enjoy each other’s company with nature as your backdrop. Furthermore, when the kids are discovering the bush with trained guides, you can go on a game drive or lounge by the pool (without the kids!). The great thing about coming to South Luangwa for a safari is the proximity to other popular Zambia destinations such as the Lower Zambezi and Victoria Falls as well as neighbouring countries, i.e. Malawi. Depending on the age of your children an extension to Victoria Falls or Lake Malawi can be a fantastic addition to the holiday. Lake Malawi may be more fitting for younger families, as the kids can interact with the local children, play in the lake and do water sports whereas Victoria Falls may be better for children 14 & over due to age restrictions on the bungee, white-water rafting and all the other adrenaline-fuelled activities. We think safaris are the perfect holiday for families. Do you agree? * Keep drives short: two hours maximum, preferably less. * Pencils and paperwork anywhere. * Keep them drinking water; stock up on emergency snacks. * Take toilet breaks – before you set out and at every stop. * Get out of the vehicle wherever and whenever it’s allowed. * Allow playing time with other children you meet on safari. * Don’t keep moving on: allow time at each destination to establish a base. * Stop whenever your child wants, even if it’s “just another impala”. * Let them pick it up – seed pods, bones, whatever – unless it bites or stings. Wash their hands afterwards. * Bring children’s binoculars and/or digital cameras (cheap is fine). * Make sure the car seat is high enough to allow a good view. Interested in taking your family on an unforgettable safari which will be fulfilling and fun? Contact us for more information.